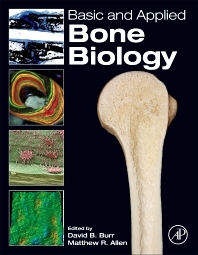 This book provides an overview of skeletal biology from the molecular level to the organ level, including cellular control, interaction and response; adaptive responses to various external stimuli; the interaction of the skeletal system with other metabolic processes in the body; and the effect of various disease processes on the skeleton. The book also includes chapters that address how the skeleton can be evaluated through the use of various imaging technologies, biomechanical testing, histomorphometric analysis, and the use of genetically modified animal models. Graduate students, medical fellows/residents, researchers, and academic clinicians in the fields of bone biology, endocrinology, osteology, rheumatology, and dentistry. David B. Burr is a University Distinguished Professor of Anatomy and Cell Biology at Indiana University School of Medicine, and Professor of Biomedical Engineering at IUPUI. He joined the Indiana University School of Medicine faculty in 1990 as Chair of the Department of Anatomy (1990-2010), following faculty positions at the University of Kansas and West Virginia University Medical Schools. He served as President of the American Association of Anatomists (2007-2009) and the Orthopaedic Research Society, and is the Director of the IBMS Sun Valley Workshop on Musculoskeletal Biology. He is a fellow of the American Association of Anatomists, and serves as Editor-in-Chief for Current Osteoporosis Reports, Associate Editor for Bone and the J of Musculoskeletal and Neuronal Interactions. He is the author of more than 230 research articles in the peer- reviewed literature, 48 book chapters and reviews, and four books on the structure, function and mechanics of bone. Matthew R. Allen is an Associate Professor of Anatomy and Cell Biology at Indiana University School of Medicine. His research career, and interest in bone biology, began at Alma College during a summer research fellowship and continued during his years as a PhD student at Texas A&M (in Kinesiology) and post-doctoral fellow at IU School of Medicine. His research focuses on understanding how interventions can be maximized to strengthen the skeleton and his teaching duties include Medical Histology (to first year medical students) and Basic Bone Biology (to graduate students). He serves on the Editorial Board for the Journal of Bone and Mineral Research, BONE, and BoneKEY, and as an Associate Editor for Clinical Reviews in Bone and Mineral Metabolism. He has authored more than 70 research articles and 18 book chapters and reviews.